If you are a fan of big, fluffy, fruit filled muffins, you came to the right place today! 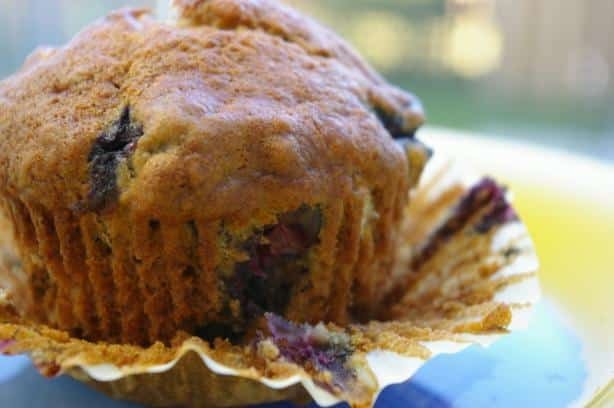 This easy Banana and Blueberry Muffin Recipe delivers a most delicious, low calorie muffin that’s full of good for you ingredients and low in Points. The average muffin at Starbucks clocks in around 9-12 PointsPlus each…..so why not make a healthier version yourself and save PointsPlus and $$$? By just making a few changes in a traditional blueberry and banana muffin recipe, it’s not hard to create a muffin that is a lot lower in fat and calories and that doesn’t sacrifice taste. They are perfect for breakfast, brunch side dish recipes, or to have with your morning coffee. Make a few batches of these and freeze them so that you always have a guilt free snack on hand! A good low calorie and healthy muffin recipe, is not always easy to find. But this Banana and Blueberry Muffin Recipe will really wow. They are moist, fluffy, and have just 5 Points each. Perfect for a healthy breakfast idea on the go! Coat 12 (1/2-cup) muffin cups with cooking spray or line with paper liners. Whisk buttermilk, brown sugar, applesauce and egg substitute in a large bowl. Stir in mashed bananas. Whisk flour, baking powder, cinnamon, baking soda, salt and nutmeg in a medium bowl. Fold the dry ingredients into the wet ingredients and stir until just combined. Fold in blueberries. Divide the batter among the prepared muffin cups (they will be full). Bake until the tops are golden brown and a wooden skewer inserted in the center of a muffin comes out clean, 20 to 25 minutes. Cool in the pan for 10 minutes, then remove and let cool on a wire rack for at least 5 minutes more before serving. Do you think there's any way to make this using agave syrup? I don't eat refined sugars. This cupcake was the best ever! My husband asked if he could have one, he thought it was delicious. He ate most of them. I did make myself a note to not leave them out….keep in refrigerator or freeze until you want one.